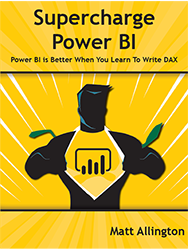 Supercharge Power BI - Power BI is Better When You Learn to Write DAX Print book + e-Book by Matt Allington. Includes a bonus e-book copy of Supercharge Excel. Released in 2018, this book will teach you the DAX language from the ground up, using Power BI as your canvas. Microsoft Power BI is a self-service business intelligence tool. Anyone can get started with Power BI by downloading Power BI Desktop, loading up some data, and building a report. But with this basic approach, you can only scratch the surface of POWER BI's capabilities. 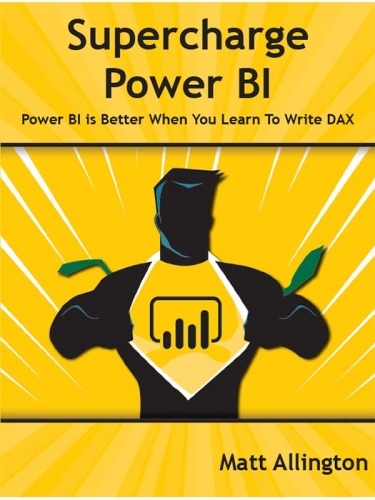 If you want to be able to supercharge Power BI, you need to learn to write DAX. Data Analysis Expressions (DAX) is the formula language of Power BI and Power Pivot for Excel. This book prompts the reader to put your new skills to the test. Written to give you hands-on practice using Power BI Desktop and writing DAX.